We recently needed to image a large number of machines in a short amount of time. Anyone who has dealt with Altiris and use Ghost as their method of imaging know that Altiris wont by default Multicast the image and will instead push it out individually to each client that connects. 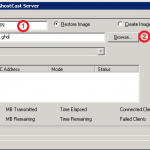 So here is a little tip on getting your images pushed out via Multicast. When you have created your imaging job, enter the properties of the imaging task and replace %IMAGE_FILENAME% to @MCSESSION with SESSION being the name of the GhostCast session we will create in the next step. 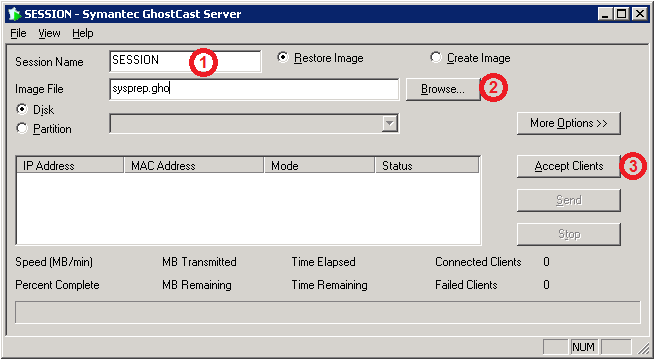 Now that we have configured the job to tell Ghost to connect to our GhostCast session it is time to start up GhostCast (which can be found under <DS installed path>\Ghost\GhostSrv.exe). Once the window is open we can say that we are going to restore an image and now select the Ghost image that we want to restore (Usually under<DS installed path>\Images\OperatingSystem\..) and now select Accept Clients. Now that we are ready to image, we can boot the computers we want to image into automation and run the imaging job we configured earlier to them. Click on the image to the right to see what your GhostCast window should look like. Now you will see once they have booted up and started the modified imaging job that they will be at the Symantec Ghost screen waiting for a GhostCast session to start. We now simply need to go into GhostCast and start sending out the image. You can see that all of the clients have also appearing in our GhostCast window. Hello! I’m at work browsing your website from my new iphone 3gs! Just want to say I love reading your blog and look forward to all your articles! Keep up the outstanding work.